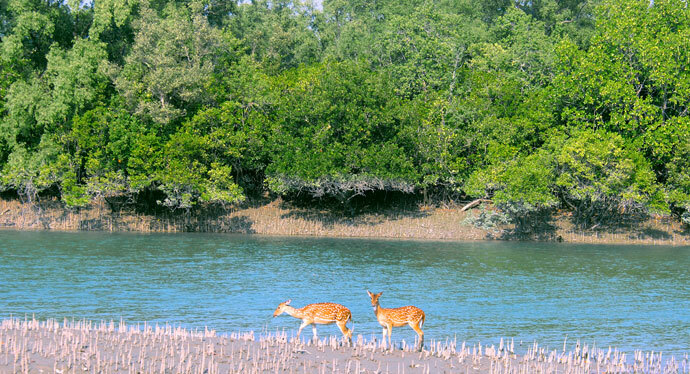 Haliday Island Wildlife Sanctuary, covering an area of 3.5 sq.km is located within the famous Sunderbans in South 24 Parganas District in West Bengal. It was notified as WLS in the year 1976 vide.Notification No.5388-For dt.24.06.1976. Nearest town is Gosaba, 50 km away. Nearest railhead is at Canning(48 km). Canning is connected to Kolkata, by train. Usuallly mangrove species flourish with some sweet water species like Casuarina, Karanja, etc. which are planted on high lands. Principal animals are chital, wild pigs, Rhesus monkey & barking deer. Matla river surrounding the Sanctuary has plenty of fishes.